MUSIKMESSE 2015: sE's guitaRF is a new reflection filter which aims to take some of the headache out of mic positioning around guitar amps. 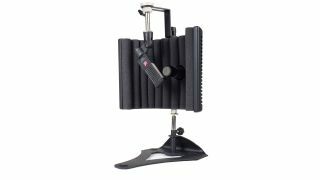 The new stand allows the user to easily phase align two microphones, and features a bracket for a small capsule mic and an overhead mount for larger condenser microphones. sE reportedly heard tell of live sound engineers modding its popular Reflexion filter units for use onstage, so it created the guitaRF as a one-stop solution for Front Of House engineers. The guitaRF™, the world's first Reflexion Filter™ created specifically for double-miking and recording guitar amp cabinets. The guitaRF™, was created to simplify and enhance the recording and reinforcement of guitar amp cabinets on stage or in the studio. Aside from isolation and acoustic filtering, the guitaRF incorporates a pass-through hole for a dynamic or small-capsule mic, as well as hardware to vertically mount a ribbon or large-diaphragm condenser. The hardware lets the user phase-align the two capsules, or space them apart to capture two sections of the speaker cone. After hearing feedback from many top FOH engineers around the world, sE learned that many of them were modifying existing sE Reflexion Filter products (like the IRF2 or Reflexion Filter Pro) to help them isolate their amp mics on stage. These modified setups can be seen on tour with artists ranging from Tom Petty to Black Sabbath, and sE's new guitaRF was designed as an off-the-shelf solution for FOH engineers that provides the same isolation achieved with these modified setups, while also allowing for the precise positioning of two microphones on the cabinet.